Do We Really Need Lawns? Like it or not, we're embedded in the natural world. We might as well learn to live more harmoniously with it. 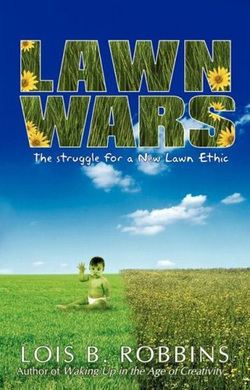 Part memoir, part how-to, part problem-solving, Lawn Wars gives a historical context and resources for a new movement that is showing up across the nation. Difficulties encountered by aspiring natural landscapers are explored with wit and factual information. The rich rewards of making such a shift are described in lyrical prose as the author tells her own story of heartache and delight. The fact that so many people are now awakening from the Cartesian dream, which drew such a radical boundary between us humans as “subject” and the natural world as “object,” tells me that it might not be too late. We are coming to realize that although now highly autonomous and differentiated, we are yet held lovingly in a universe that is juicy with meaning. We are beginning to feel in our bones, some of us, that creativity originates not with the human, but constitutes the very ocean in which our lives swim. We dwell within Anima Mundi, or World Soul. It throbs within us. . . . With this new way of being comes a more secure place for ourselves in the scheme of things. Out of that security grows a wedding of knowing and acting. From it flows gratitude, and I cannot think of a more perfect way to experience and express gratitude than through the practice of natural landscaping. Ostensibly retired, Lois B. Robbins chaired the North Oakland Headwaters Land Conservancy’s Brandon Preservation Committee in Oakland County, Michigan from 2001 - 2011. In 2003 she founded the Village of Ortonville’s Annual CreekFest, a celebration of her town’s trout stream. For eight years, she coordinated public education for her Township’s Stormwater Management program and in 2006 and 2007 Lois and her dirt-under-the-fingernails team installed two native landscape demonstration projects in Ortonville. In 2009, Lois received the Heritage Partner Award from Oakland County Planning. The 2008 recipient of the Joe Leonardi Leadership Award from the Flint River Watershed Coalition, Lois also received the 2004 North Oakland Headwaters Land Conservancy’s Thomas K. Bullen Achievement Award, as well as the 2002 Ortonville VFW Medal for Citizenship, and the Ortonville Community Historical Society’s Certificate of Appreciation. A retired adjunct professor from University of Detroit, Lois holds a Master’s degree in Spirituality. In addition to Lawn Wars, she has published Waking Up in the Age of Creativity. For five years she co-edited ECOlogic, the newsletter of the Upland Hills Ecological Awareness Center, and from 2002-2007 she wrote a nature column for the Oxford Eccentric. Lois lives in rural north Oakland County, Michigan with her cat, a flock of itinerant wild turkeys, a tribe of deer, and a diversity of other back yard wildlife residents. On her small piece of property, designated by the National Wildlife Federation as a Backyard Wildlife Habitat, she practices casual natural landscaping on an as-needed basis. The rest, she leaves to nature to figure out. Click the book above to order it.